Government’s focus towards digitization, financial inclusion, fintech, Aadhaar-based identification and GST-based simplified taxation are going to be some of the key drivers of growth. 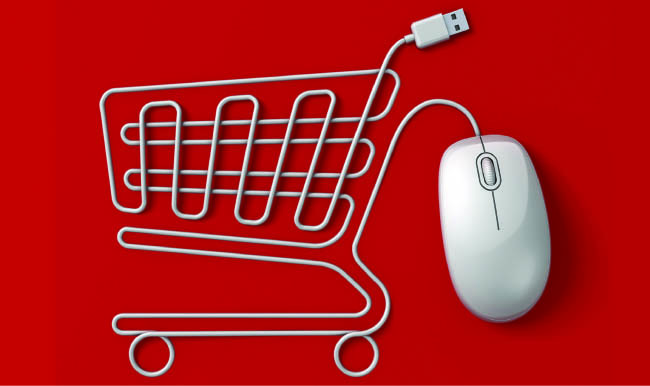 Investment banking firm Morgan Stanley, in a recent report, predicts that India’s e-commerce market for gross merchandise value (GMV) will reach $200 billion by 2026, growing at a CAGR of 30%. This growth, if it happens, the firm says, will help grow the overall market penetration to 12% in the next nine years, as against 2% today. The phenomenal growth of internet users, the firm says, is primarily driving the e-commerce market. The other factors that are contributing to this growth are growth in digital payments, ease of making a purchase, CoDs and e-commerce mobile apps. According to an Internet and Mobile Association of India (IAMAI) and Kantar IMRB study, the number of internet users in India is expected to reach 500 million by June 2018. The number of Internet users stood at 481 million in December 2017, an increase of 11.34% over December 2016, said the report titled, “Internet in India 2017”. 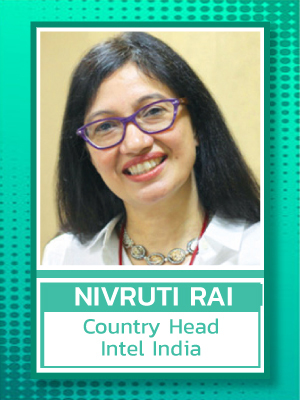 The ongoing digital transformation in the country is expected to increase India’s total internet user base to 829 million by 2021 (59% of total population), from 481 million (39% of population) in 2017, while the total number of networked devices in the country is expected to grow to 2 billion by 2021, from 1.4 billion in 2016. Another important factor for this growth has been the growth in the digital payments sector, which has surged post-government’s move to demonetize high-value currency notes in late 2016, which led to increase in digital transactions. More than 800 million bank accounts are digitally linked, increasing the number of people to have access to internet and digital cash to make e-commerce market surge. However, still 55-60% of total e-commerce transactions continue to be through cash on delivery mode. Implementation of GST also opened the doors for the e-commerce markets like UP, Bihar and West Bengal, where due to waybill formalities goods above a certain price were not being sold. GST has also changed the warehousing requirements which have moved from being taxation and logistics issue to pure logistics consideration. Implementation of GST will push down the cost logistics, warehousing and will also lead to lower inventory level requirement, positively impacting the industry. In India, total online spending, inclusive of domestic and cross-border shopping, is expected to increase by 31% year-on-year to Rs.8.76 trillion (US$135.8 billion) by 2018. India’s e-commerce revenue is expected to jump from $39 billion in 2017 to $120 billion in 2020, growing at annual rate of 51%, highest in the world. 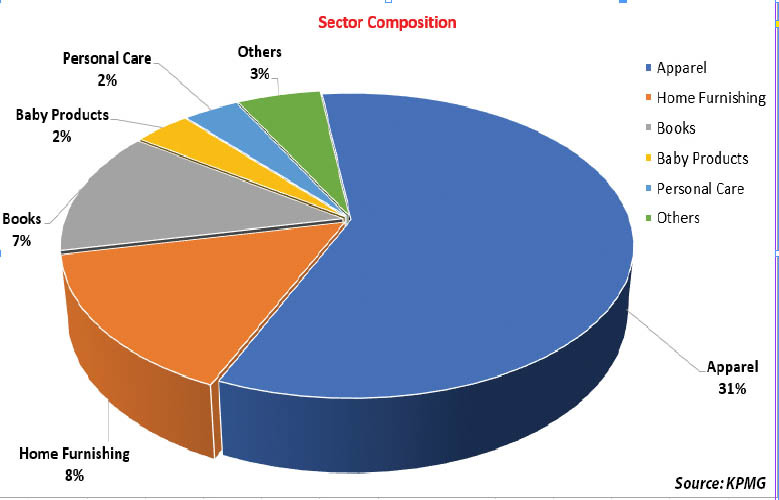 Online travel agents account for the largest market share (70%) in the internet consumer market, while the remaining 30% is occupied by horizontal e-tailing, fashion, furniture, grocery, hotel, food tech, cab aggregators, education technology, and alternative lending, among others. The internet industry in India is likely to double to reach US$250 billion by 2020, growing to 7.5% of Gross Domestic Product (GDP), with the number of mobile internet users growing to about 650 million and that of high-speed internet users reaching 550 million. However, India had only 60 million online shoppers in F2017, which was 14% of the total internet population, versus 64% in China. AlphaWise survey done in 2014 probably has the right answer to this stats. According to this survey, Individuals with Over Five Years of Use on the Internet Were More Likely to Transact Online, users with less than two years of activity on the internet were less susceptible to transacting and primarily indulged in emails, messaging and search. Good news is that a large chunk of the internet base in India has emerged only in the last few years and will mature by 2019 and beyond and that could possibly be when online shopping sees a massive inflection. The Indian e-commerce market is primarily dominated by two players – the Indian unicorn Flipkart and Seattle-based Amazon. While Flipkart has been in the market since 2009, American giant entered the market in 2013. Amazon has so far invested $2 billion in India and has a commitment of $5 billion, Flipkart has $4 billion war chest and is in talks with WalMart for an investment of $7 billion. Amazon has been able to shake up the market and already commands 31% share in the Indian market compared with Flipkart’s 32%, according to a report by Forrester. But the gap widens when Flipkart Group-owned fashion retailers Myntra and Jabong are accounted for. India’s largest e-commerce company’s total share then goes up to 39.5%. With addition of eBay.in to its kitty, Flipkart has further cemented its position. With the entry of Alibaba supported Paytm with its Paytm mall into picture, a very formidable challenger has emerged. In less than a year of its launch, Paytm Mall has garnered a market share of 5.6% and is negotiating a funding round of Rs.3,000 crore from SoftBank and another Rs.1,000 crore from other investors. This round of funding is expected to take the valuation of Paytm Mall to $2 billion level. While smartphone is the biggest segment for online market players accounting for more than half the sales, followed by fashion, one of the fastest-growing segments is grocery, which currently accounts for a small fraction of overall sales for these giants. Given that grocery accounts for more than half of overall retail market in India, it is a matter of time before the trend starts reflecting in the online space as well. According to Forrester, Amazon’s grocery sales hit a $180-$200-million mark and are the market leader in the segment. BigBasket, an online supermarket, which is an early mover in the segment, features in the top 10 players in terms of market share with 1.5%. To stay ahead and fend off Amazon and Flipkart, it has recently announced a move to open offline kiosks that will stock daily groceries and is also planning to start its own subscription service for items such as milk and bread. The move comes soon after BigBasket raised $300 million in funding led by China’s Alibaba. The company currently has Rs.200 crore monthly revenue and is aiming for Rs.500 crore by March 2019. Grofers, which is the second-largest standalone grocery player, has grown four-fold in the last one year with monthly sales in excess of Rs.100 crore. It has secured Rs.400 crore in a fresh funding round, led by existing investor and Japanese internet conglomerate SoftBank Group. With this, Grofers’s total funds raised to date have touched US$226.5 million. Snapdeal which was once touted to be a straight rival to India’s largest e-commerce player Flipkart, now is just a company with a meagre 2.5% market share in the Indian e-commerce space. After its debacle last year, the company saved itself from being sold to Flipkart and was relaunched as Snapdeal 2.0 in mid-2017. To push its sales, Snapdeal has struck a new deal with as many as twelve banks and a bunch of digital wallets to offer discounts of worth up to Rs.100 crore in the next twelve months. SopClues, which has always remained out of limelight, is also amongst the top 10 players with 2.1% market share. E-commerce platform SopClues has reported 60% growth in 2017-18 fiscal year. It also reported trimming of losses by 40%. 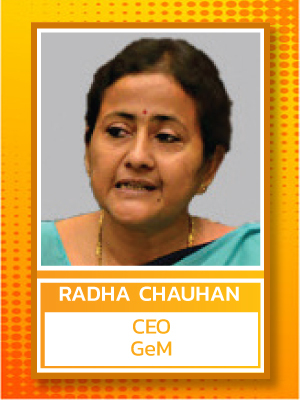 Growth came from categories like fashion and strengthening of position in the tier-III cities and beyond. The Gurgaon-based company claims to be confident of hitting profits in the next 12-18 months. 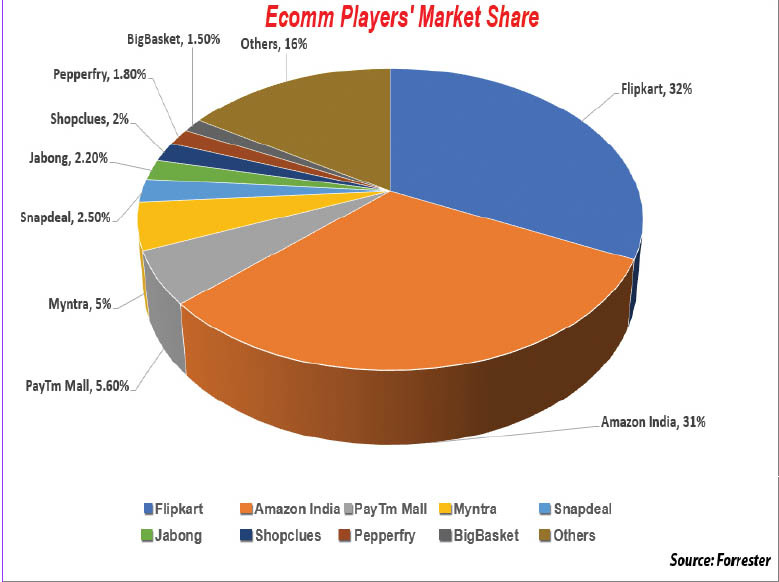 Furniture and home products marketplace, Pepperfry.com also features in the top 10 players based on market share with 1.8% of the pie. Like grocery segment, even in this segment there is a movement towards brick-and-mortar experience centres with the option of offline sales to augument online sales. Pepperfry.com has recently announced that it has raised Rs.250 crore in a fresh round of funding from State Street Global Advisors. The fresh funds will be deployed to expand Pepperfry’s Experience Centres in Tier-II towns, invest in developing AR/VR technology for virtual touch and feel, and enhance the Private Brand franchise. Most of the e-commerce happens through mobile apps. If we consider the number of mobile apps downloaded, the stack looks different. Paytm which is the third-largest player in terms of revenue leads the pack here, followed by Amazon and Flipkart. Snapdeal seems to have managed to regenerate industry from consumers and ranks fourth in terms of downloads. Myntra which focuses on fashion/apparel segment and is part of Flipkart is in the fifth place. Fifth place onwards, all the players except SopClues is in the fashion/apparel segment. LimeRoad which is a sixth place is a Gurgaon-based startup, which offers curated fashion, and claims to have grown at over 250%, while the online fashion industry has grown at 5% to 10%. It also expects to be profitable in the next 18 months. LimeRoad started in 2012 as a social discovery platform for e-commerce and has raised $50 million in three rounds of funding from Tiger Global, Matrix Partners and Lightspeed Venture Partners, among other investors. 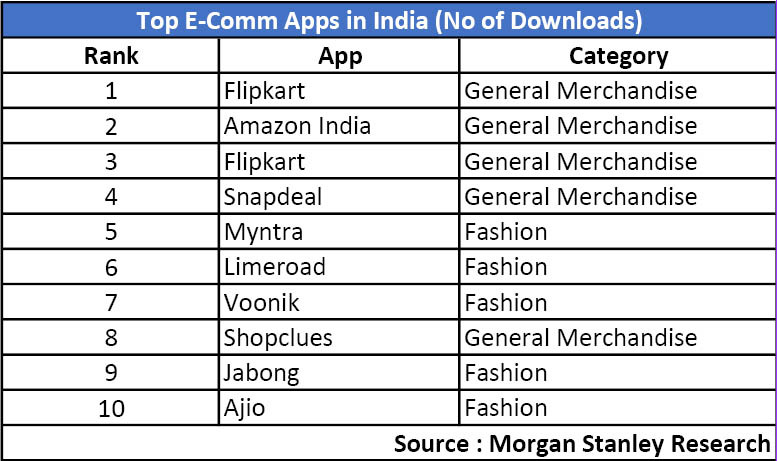 Voonik, another fashion e-tailer, is at the seventh spot. Launched in 2013, Voonik is a personal shopping app for women, which allows them to buy apparels from multiple stores, according to their body type, lifestyle and budget. Between 2013 and 2016, the fashion retailer raised close-to $27 million funding from investors like Sequoia Capital, Times Internet, Seedfund, Beenos, BEENEXT, Parkwood Bespin, Tancom Investments, and Kunal Shah. SopClues and Jabong are at eighth and ninth spots, while Reliance Industries Ajio, which again in fashion space, is at tenth spot. According to an EY report, investments in the Indian e-commerce industry touched an all-time high of $11.2 billion in the first half of 2017, a 41% rise over last year. In a fierce competitive Indian market space, Flipkart, in the year 2017, managed to show its supremacy over its closest competitor Amazon. The Bansals-founded firm raised around $4 billion this year from multiple investors including eBay, Microsoft, Tencent and SoftBank. In the same year, the Singapore-based parent of Flipkart has invested Rs.4,472 crore in its wholesale arm. The American retail behemoth Amazon had already invested $5 billion in India, in addition to the $260 million earlier this year. In October, Amazon Inc. invested another $250 million (Rs.1,620 crore) into Amazon India. Digital payments company Paytm launched its e-commerce arm Paytm Mall in February 2017. Backed by Alibaba’s $200-million investment, Paytm Mall reportedly invested Rs.1,000 crore for advertising and marketing during the festive shopping period, and even claims to have hit their annual target of $4 billion during the Diwali sale. In what could be the biggest shakeup in the market, Reliance Retail plans to raise Rs.4,000 crore through rights issue to help fund expansion, which, experts believe, would be in the online space. With a network of 3,800 brick-and-mortar stores across the country, entry of reliance in the online space could have a similar impact as to what happened in the telecom space with Reliance Jio. Amazon made some headway in the non-perishable grocery category through Amazon Pantry, now available in around 30 cities. Through Amazon Now, the company does in-two-hours delivery of groceries, including perishables, in Bengaluru, Delhi-NCR, Mumbai and Hyderabad through partnerships with BigBazaar, Spar, Hypercity and other supermarkets. Flipkart also started grocery segment for customers in Bengaluru as part of its soft launch. The company also took over eBay.in in the year 2017. In exchange of an equity stake in Flipkart, eBay had made a cash investment of $500 million and sold its eBay.in business to Flipkart. Flipkart and eBay will also partner to leverage opportunities in cross-border trade. WalMart Inc., the world’s largest retailer, is looking to double down on investments in its e-commerce business, hire more top tech talent from countries like India, and invest in or acquire Indian tech startups, amid a bruising global battle against Amazon.com Inc. According to reports, WalMart is looking to buy majority stake in 2-3 Indian eComm startups. BankBazaar, a financial marketplace startup in India, raised US$30 million in a funding round led by Experian Plc, a credit rating agency based in UK, taking the company’s total funding to US$110 million. Gozefo.com, a Bengaluru-based used furniture and appliances platform, has raised Rs.60 crore (US$9 million) in Series B funding from Sequoia Capital India, Helion Venture Partners and Beenext Pte. Ltd.
Online furniture retailer Urban Ladder has raised $12 million in a fresh round of funding led by the existing investors Sequoia Capital, SAIF Partners and Kalaari Capital. • Reserve Bank of India (RBI) has decided to allow “interoperability” among Prepaid Payment Instruments (PPIs) such as digital wallets, prepaid cash coupons and prepaid telephone top-up cards. • Finance Minister Arun Jaitley has proposed various measures to quicken India’s transition to a cashless economy, including a ban on cash transactions over Rs.300,000 (US$4,655.1), tax incentives for creation of a cashless infrastructure, promoting greater usage of non-cash modes of payments, and making Aadhaar-based payments more widespread. India is still a nascent market in terms of e-commerce with just 2.5% of overall retail market coming from online retailers. India is also a vastly different market compared to any other developed market with vast diversities culturally, financially and between urban and rural, and will require local solutions to be evolved both by domestic and international players. While the current market space is dominated by Amazon and Flipkart, the Indian market at this stage can, and will, see a lot of new players coming into the fray and consolidation in this space is still far away. Indian giants have so far not entered the space which is currently startup driven. However, Reliance Industries is planning its foray into the space and promises to shake up the market. Other players like Aditya Birla group and Future Group might also enter and are likely to enter the space sooner than later. India is a fast-growing economy which is likely to grow at 7% or faster annually, pushing millions in the middle income category and thereby increasing the customer base faster than just the age factor would entail.